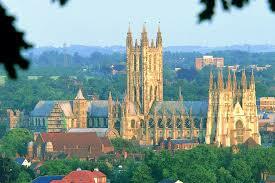 Canterbury is just 1 hour 30 minutes by train from Victoria Station. Canterbury Cathedral, an easy walk from Canterbury East Station, is a good place to start – this is the Mother Church of the worldwide Anglican Communion and seat of the Archbishop of Canterbury. It is a place of worship and part of a World Heritage Site. Pilgrims and visitors have made their way to the Cathedral since the Middle Ages. Geoffrey Chaucer's Canterbury Tales, written between 1387 and 1400, tells the stories of a group Pilgrims making their way from London to Canterbury Cathedral to visit the Shrine of Thomas Becket. There is an entrance fee of £12.50 per adult, although there is plenty to see. If Cathedrals aren't your thing, there are plenty of shops to choose from, or you can elect to enjoy a free outdoor trail combining art and historic open spaces. The Canterbury Sculpture Trail, starting at Lady Wootten's Green, finishing at Greyfriars Garden takes you on a tour of the city and lets you experience public art, parks and gardens and the riverside. There are public toilets along the trail at Whitefriars, Dane John Park, Toddlers Cove (Westgate Parks) and at Kingsmead Coach Park. The total distance is 3.2 miles, taking approximately 1 hour 30 minutes to complete. Chichester is placed just 1hr 30 minutes by train from Victoria Station. Established by the Romans, this historical city has plenty of things to occupy your day. The magnificent Cathedral, with its spire dominating the skyline, combines historic architecture with a varied and world-famous collection of modern art, including in its treasures a window by Marc Chagall and a John Piper tapestry. Wander through Chichester along to The Guildhall, once part of a grand Franciscan Friary that stood in Priory Park and discover the history of Chichester at The Novium, the City’s newest major attraction which takes you back to where it all began - with the remains of a Roman bath house. Again if you like shopping, there is great variety of high street brands, independent retailers as well as regular markets and fairs, cafes and restaurants, so you’re sure to find what you need. Lewes is the county town of East Sussex and is 1hr 7 minutes from Victoria Station. Visit Lewes Castle, or Anne of Cleaves Museum, take a walk through Grange Gardens. The gardens are a little piece of heaven on earth right in the centre of Lewes town, a lovely peaceful thing to do! Of course there are plenty of independent shops, historic pubs and places to eat - a thoughtful guide has been produced for visitors to download. Salisbury grew from a medieval market town to the City of today. Situated in Wiltshire, Salisbury can be reached in 1 hour 30 minutes by train from London Waterloo station. The Cathedral has the tallest Spire in the UK, at 404 feet. Only four copies of Magna Carta dating from 1215 have survived the ravages of time and Salisbury Cathedral is proud to be home to the best preserved original manuscript. Salisbury has more than a thousand years, of history and its streets form an architectural timeline ranging from medieval walls and half-timbered Tudor town houses to Georgian mansions and Victorian villas, giving plenty of photo opportunities. There is a large, open air market held every Tuesday and Saturday, selling fresh local meat, vegetables, honey and lots more. If you would like to do a walk, you have a few to chose from in this leaflet. When you decide it's time for refreshment, there are plenty of pubs and inns to choose from, some dating back to the 14th Century. If you are thinking of visiting Stonehenge, it's probably advisable to do it on a separate visit. Windsor is 55 minutes train journey from Waterloo Station. When you arrive the most obviously building you'll see is Windsor Castle. If you are interested in the Royal Family, then it is definitely worth a visit, although best to book tickets in advance. There are of course other things to see and do that don't involve going into the castle! Turn your back on the castle, and take in an eyeful of the Long Walk. It's accurately named. The path leads in a straight line 2.7 miles to Snow Hill, a mound topped by an equestrian statue of George III. Windsor and Eton Central station was, briefly, a terminus of the District Line. Between March 1883 and September 1885, it was possible to catch the Underground from Mansion House in London all the way to Windsor. The station still operates a shuttle service to Slough, but most of the buildings are now converted to restaurants, cafes and shops. On the High Street, next to the Guildhall stands (just about) the Crooked House. Now a jewellers, this remarkable building really does appear to be falling over. Despite the medieval appearance, it dates from 1687 — when work also began on the Guildhall. To the left of the Crooked House is Queen Charlotte Street. It is supposedly the shortest street in Britain, as recorded on a plaque. Windsor has many pubs. The Duchess of Cambridge on Thames Street manages to combine historic premises with a modern feel. I read that it's named after the actual, living Duchess of Cambridge and took the name around the same time as she did in 2011. Taking time out to visit other places on a trip to the Capital is definitely worth it. You get to see more of the countryside on the train journey, get to see more of the history this island has and sample more of it's pubs! If you would like to stay a bit longer in places, check out our AirBandB link for a discount. Let us know if you have a favourite place to visit – we are always looking for more adventures.